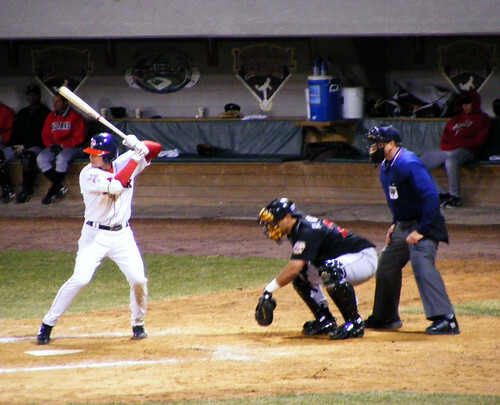 04-04-08-PawSox-02, originally uploaded by jasonandrewlayne. Had we entered the break mired in second place, I would have made some statements to the effect that the standings at the All Star break count for little. So I’m little inclined to make too much of a half game lead. Particularly after a game in which Matsuzaka threw only 68 of 115 pitches for strikes and the offense left 20 men on base. Still, first tastes better than second. It’s not often you make up five games in a week. And while it’ll ultimately be of minimal import, the fact that the Tampa kids are hearing footsteps is not terrible news. Lest we get carried away, bear in mind that our club yet has serious problems. Even as we slightly underperform our Pythagorean expectations and Tampa outperforms theirs, as the Joy of Sox notes. The bullpen is yet unreliable, as last night’s contest reminds us, and our offense – the explosions against the Twins and O’s this week aside – is streaky. Masterson should help the former and the Large Father the latter (knock on wood), but I assume that Theo and folks are working the phones. Yes, Tampa just dropped seven games in a row, but should they, for example, pull off a Murton and Street trade, we may have a problem. A number of you have suggested that Ellsbury’s struggles of late might be attributable to his June 5th injury; the diving catch that resulted in a sprained wrist. You may be right. Granted, it’s 60 fewer at bats, but still. Here’s hoping the break does the kid some good. Sending big Lars Anderson to the hitter’s haven that is Lancaster figured to produce some fireworks, and Anderson hasn’t disappointed. As hot as Anderson was in June, when he hit .360/.440/.490, he’s been even better in July. Anderson has already cracked four home runs in nine games this month, three of which have come away from Lancaster. He did more than hit for power this week, as Anderson reached base at least once in every game and strung together four multi-hit games. For the season, Anderson is batting .324/.416/.529, ranking him fifth in the league in average and third in on-base percentage. Anderson currently ranks seventh in the California League with a .916 OPS, with a complete line of .317/.411/.505, 18 doubles, 11 homers, 45 walks, and 57 strikeouts in 281 at-bats. The league OPS is .744, so his OPS is 23 percent above league context. A left-handed hitter, he’s destroying southpaws to the tune of .383/.462/.617. Against right-handers he’s at .290/.391/.460, an interesting reverse platoon split but one that likely indicates he won’t have to be platoooned at higher levels. I like the high walk rate along with reasonable strikeouts. His home run power may be a bit less than you’d expect from a 6-4, 215 pounder, although he’s obviously dangerous and his home run power is expected to continue to increase. He is still just 20 years old. On the negative side, Anderson has a sharp home/road split, .359/.451/.579 at home in the friendly confines of Lancaster, .272/.365/.426 on the road. On the other hand, the home/road split has lessened of late. He spent some time on the DL with a sore wrist in May, and has been blistering hot since returning to action in June, hitting .369/.450/.533 in 30 games since returning from the wrist injury. It’ll be interesting to see if the presence of Anderson influences our appetite for Texeira, if or when he becomes available as a free agent. I don’t think we’re going to see any changes real soon. Lugo is the starter for the time being. There are no terribly appetizing trade options, so until Lugo’s OBP goes down below, say, .330, we’re not going to see Lowrie brought up and given a shot. At the time, I agreed. And we all know what’s happened since: Lugo strained or tore – depending on who you believe – his quad, and is out for four to six weeks. And just like that, Lowrie replaces Lugo. The question is for how long? Probably four to six weeks. Particularly if Lowrie is as minimal a factor as he was in yesterday’s contest. Which could be a concern, as he’s been in something of a funk to open July, putting up a .176/.275/.294 down at Pawtucket in 9 games this month. But what if the kid plays well? Lugo lamented his injury, claiming that he’d just “found his swing.” Which is interesting, since July was shaping up to be his worst month since April (.259/.323/.259). When he comes back, assuming he won’t be a hundred percent in the field, the only thing arguing in his favor for playing time will be the inexplicable $9M we’re paying him. Odds are Lugo will get his job back. And those of you that have been around a while know that Lugo’s not exactly my favorite player. But I do think it’s worth questioning how far we’re going to go with a shortstop that was essentially terrible before he tore his quad. Last week, I expressed surprise that Buchholz hadn’t been brought up and Masterson shifted to the pen. Well, it looks as if I was a week early, because Bucky’s back and Masterson will be soon. And none too soon, though he’s not likely to help our walk numbers out there. Barring an injury, I think Hansen’s not long for our pen. If he was able to throw even a few more strikes, I might argue for a Timlin exit (as I’m of the opinion that there’s a giant fork sticking out of his back), but the young reliever’s not giving me a leg to stand on. Couple Timlin’s marginally improved performance since his return from the DL (4 IP, 1 ER, 3 H, 3 K, 1 BB) with Hansen’s ongoing inability to throw balls over the plate (26.1 IP, 25 H, 18BB, 22Ks), and I can’t see anyone but Hansen being sent down. Not least because he’s the only one that actually can be sent down, as far as I know. There are probably a couple of other players that would be of potential interest – Michael Almanzar, Bubba Bell, or even George Kottaras – that’s a reasonably complete list. The one thing I haven’t heard many people discuss: Bowden might be overvalued at the moment, his calf injury notwithstanding. Given his performance at Double A, he might be considered by other clubs an elite pitching prospect, but his ceiling is likely considerably lower than that. That doesn’t mean you trade him; pitchers of his caliber don’t grow on trees. But it may make him more of a tradeable commodity than he would otherwise be, particularly in a deal involving young catching talent. One of the conversations I’ve been having over and over concern’s Varitek’s future. On the one hand, he’s been absolutely miserable with the bat this season. Out of 19 MLB catchers that have seen 250+ ABs this year, Tek is 17th in average,16th in OBP, and SLG. That’s not good. On the other hand, there’s his celebrated reputation for working with pitchers, his tenure and stature with the club, and the fact that catching around the majors is horribly scarce. Between those two positions, you might think, lies a compromise path that would keep our captain in a Red Sox uni for the remainder of his career. He’s a 36-year-old guy who has played his heart out for a long time. He was not exactly a gifted hitter. He really hasn’t had a good offensive year since 2005, so where is he at this point in his career. What worries me about this for the Red Sox is that this becomes ugly as it comes to the end of the year and he approaches free agency. I know we have people saying you have to sign him no matter what, but if you have Jason Varitek for four years and $40 million or you have Brian Schneider for one-year and $3 million, there’s no question you take Brian Schneider for the $3 million in my mind. As much as I really like Varitek, he’s at the point where you really worry about where he’s going to be. Two years at $7 million is fine, but I think that Scott Boras is going to convince someone out there that he’ll make the difference with the pitching staff. And you’ve always got the Mets. They offered Jorge Posada five years at the age of 36, which is one of the most laughable offers of all time. I think if they get down to the end of the year and there’s no progress and Scott is looking for those four years. Jason is a very loyal guy to Scott and it could create a chasm between Varitek and the club that could be a problem coming down the stretch. It’s not so much that I’m wedded to the idea of having Varitek; it’s more that I don’t know who we’d replace him with. Farewell, Bobby Murcer. Though a Yankee, you were by all accounts a classy individual and a credit to your city and club. RIP. I think bullpen help could be found in Cincinnati; there's no way we're joining the upper half of the division this year [.500 will be a good year], so some of our excess arms could be sent along in minor deals. That, or you could have Arroyo back.